Hell’s Belles is the sequel to The D’Evil Diaries, which I reviewed last year and thoroughly enjoyed. 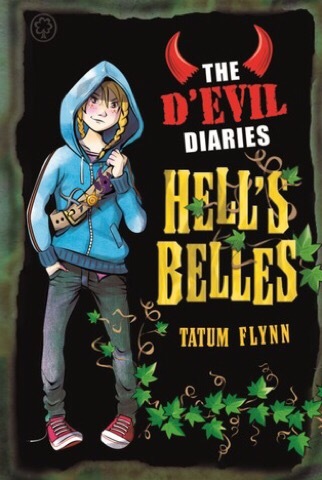 Fans of the original will be glad to know that Hell’s Belles is more of the same, with an extra twist – this time, the main character is Tommy, the only human child in the underworld, and Jinx’s best friend. As the title suggests, the women of the underworld are front and centre in this story. Tommy is worried about her position in Hell, especially now that Jinx’s mother, Persephone, known as the Terror of the Boneheads, is on her way back to the underworld. As a bonehead herself, Tommy is understandably worried about Persephone’s reaction to her son having a bonehead as his best friend. Also on the scene is Lilith, Lucifer’s first wife (which makes her Jinx’s stepmum or something). She’s back in hell for some mysterious reasons of her own – and given her son was involved in a plot to overthrow Lucifer (see the previous book) there’s not much chance those reasons are benign. And then there’s Pandora, the mythical woman with the box containing all the world’s evils. What does she have to do with Tommy? When Lilith sets up a contest to become her assistant, Tommy sees it as an opportunity to fit in; but is it all a big mistake? Will there be danger, excitement, shenanigans, and mysteries? As before, Ms Flynn juggles an exciting plot with terrific humour with ease. My favourite character, Loiter the demon of Sloth (who appears as a giant sloth) is on hand to dispense wisdom and wisecracks, and the relationship between Tommy and Jinx provides plenty of drama and funny lines. The artwork, once again by Dave Shephard, complements the text perfectly, full of energy and humour. His pictures of Loiter are fantastic, and he does a nice line in demonic hell-kittens that makes me grin. One of the things I like about these books is the eclectic approach to mythology – while obviously based on the Miltonian fallen angel Lucifer, there are big chunks of Greek/Roman myth in there too (with Persephone and Pandora) and also elements of Sumerian mythology (to which the Jewish myth of Lilith might be related) all mixed up with inventions like shocktopuses and dreadbeasts. And it all works as a coherent whole, despite the disparate origins of the parts. Funny, exciting, clever, and charming – this is an excellent sequel that bodes well for the future adventures of Jinx and Tommy. This review is very useful especially mention of the mythology references. I am hoping that it is suitable for the 10-12 year old bracket. I am trying to find new books for boys 11-13 years who have read and enjoyed Harry Potter, Lord of the Rings, Septamus Heap and Percy Jackson. Yes, this is definitely suitable for 10-12-year-olds; it has more comedy than the other books you mention, but lots of action, too. It’s normally shelved in the 8-11 section, but I’d say it skews to the upper end of that.